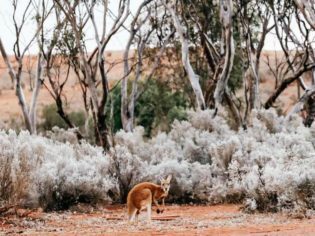 Kangaroo spotted on the way to Kalgoorlie, WA (photo: Elise Hassey). 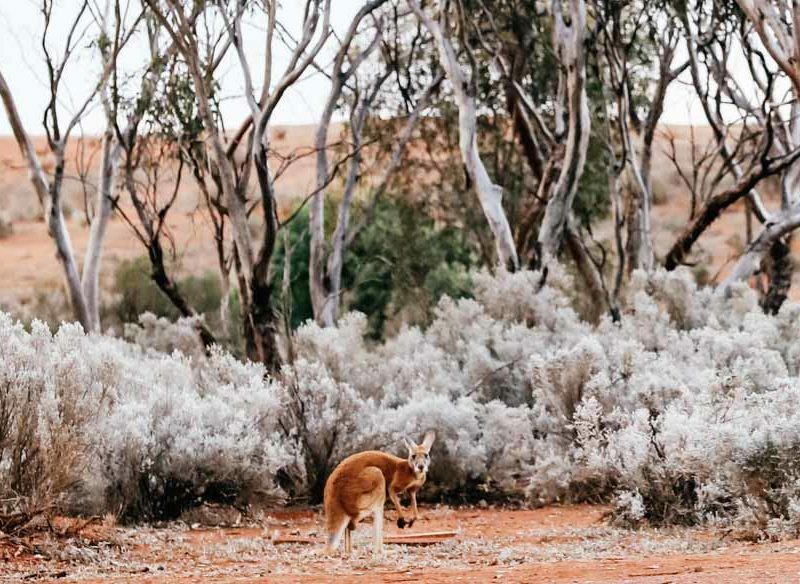 Discover Kalgoorlie, a frontier town with a colourful history, and the world’s largest outdoor art gallery at Lake Ballard, WA, on the final leg of our Golden Outback road trip. Leaving our newfound slice of paradise behind, we track towards the goldfields. It’s only 3.5 hours away but the contrast couldn’t be more dramatic. We arrive at Kalgoorlie’s Super Pit and stare in wonderment at the layers of red and purple earth, listening to the constant hum of the mega trucks 500 metres below. Gold-rich Kalgoorlie produces 10 per cent of the world’s gold and, like any frontier town, it has a colourful past. It’s a surprise to hear about a young Herbert Hoover, destined to become US president, falling in love with a local girl during his stint as a mining engineer in 1897. As the story goes, Hoover promised to return for the girl; even shipping a gaudy floor-to-ceiling timber mirror (now on display in the entrance of the Palace Hotel) back to her as symbol of his intentions. However, we’re told he never returned. It’s at Hannans North Tourist Mine – an open-air museum – that you get a tangible sense of what life was like for these 19th-century gold prospectors. In the morning we’re on the road again, bound for the world’s largest outdoor art gallery, Inside Australia, at Lake Ballard. It was created in 2003 by British sculptor Antony Gormley as part of the Perth International Arts Festival’s 50th anniversary. It’s a two-hour drive, with a coffee stop at Menzies, which, at the height of the gold rush in 1894, had a population of 5000. Today, like many towns in the goldfields, the official number has dwindled. Fifty-one of those who remain were immortalised in Gormley’s installation, including Vashti Sambo who recalls the excitement that gripped the town when residents were invited to take part. “We had to take all our clothes off and (Gormley) laser scanned us, like in the movies,’’ Vashti says. You access Lake Ballard on an unsealed road of red earth. The magic of the installation stuns us as soon as we get out of the car. To walk the full circuit, taking in all 51 iron statues, is 10 kilometres and a sign indicates a three- to four-hour walking time requiring at least five litres of water per person. We only walk part of it, but I feel an immediate connection to the vastness of the landscape. There’s power in the silence and the mirrored expanse of lake. Eventually the stifling heat drives us back to the car, bound once more for Kalgoorlie before we head home. We delay our departure with a sundowner at Goldfields Golf Club. The unnaturally green fairways look out of place against the thick red earth. Soon about 10 kangaroos appear, their silhouettes dotting the horizon. We reminisce about our little adventure. There have been many highlights; it hasn’t just been a holiday but an incredible journey close to nature, with extraordinary contrasting landscapes and many moments of calm. I take a mental snapshot, filing it away to be brought out in times of everyday fluster, to be thought of fondly as that time I discovered the wonderful, calming power of the great open road.